Javier Ballesteros, the son of five-time major champion Seve, will compete at next week's Northern Ireland Open at Galgorm Castle. 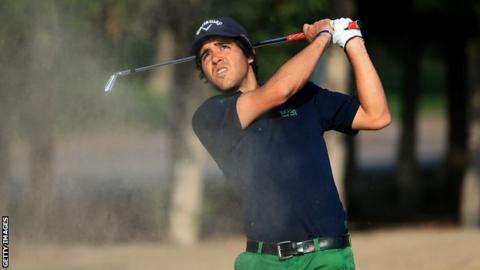 The Spaniard is playing on the European Challenge Tour this season after turning professional last November. The 24-year-old's best finish this season is a share of 18th place at the Najeti Open in France in June. Galgorm Castle tournament professional Michael Hoey will lead the field at next week's Challenge Tour event. For the third successive year, five-time European Tour winner Hoey will be the tournament ambassador in the Galgorm event and he will be hoping to make the cut next week after failing to survive into the weekend in 2013 and 2014. Ballesteros will be among several international competitors hoping to land the title won last year's by Swede Joakim Lagergren. Another Spaniard Nacho Elvira will compete as he aims to secure his third Challenge Tour win which would guarantee him automatic promotion to the main European Tour. Welshman Rhys Davies, who narrowly missed out on qualification for the European Ryder Cup team in 2010, will have the same incentive when he tees up at the Ballymena venue after his wins in Turkey and Spain this season. Davies won the Hassan Trophy on the European Tour five years ago. Ballesteros competed at the British Amateur Championship at Royal Portrush last year but failed to qualify for the matchplay stage after a poor opening round.